Tiburtini Olive Oil for sale. Buy online at Zingerman's Mail Order. Gourmet Gifts. Food Gifts. Val Neff-Rasmussen is a writer and food finder at Zingerman's Mail Order. 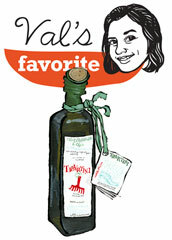 We sell about three dozen different olive oils—so how does one go about picking a favorite? For me, the choice was made almost as soon as I met Emanuele Lolli, the man who makes Tiburtini olive oil. In the foothills to the east of Rome, the Lolli family has been tending their groves of olive trees for the past three centuries. They grow more than 15 varieties of olives, and some of the trees are seven or eight hundred years old—two factors that help to create a bold, complex olive oil. Emanuele does all the little things right: the olives are picked by hand, and pressed into oil within 24 hours. But what really sold me on his oil was the incredible lunch that his wife, Rita, prepared for the three of us when I visited their home in Tivoli, Italy. Tiburtini olive oil was featured everywhere: in the well-dressed salad; over a plate of mozzarella and tomato; in a spaghetti dish with garlic and wild asparagus. The flavor of the oil is assertive but smooth, a little grassy, with a warming peppery kick in the finish. It pairs well with just about everything I want to use it for, whether in salads, over meats, atop soups, or—my very favorite—poured generously over paesano bread with a sprinkle of sea salt.